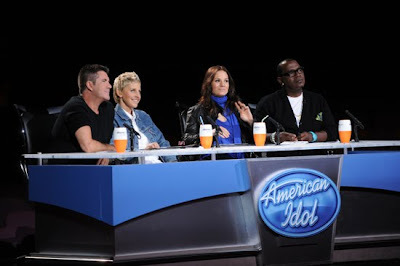 American Idol Season 9 Hollywood Week, Round 1 Recap: Ellen DeGeneres and Andrew Garcia Emerge Victorious! Well color me tickled, the first night of American Idol Season 9 Hollywood Week, Round 1 was no disappointment. Clever song choices, newcomers with mad vocals, and what's that, a judge who pays attention to the contestants(!?) (gasp!) were all found in tonight's episode. And since I'm a bit sleepy, I'm going to get right down to business. A few highlights, if you will. 1) Ellen is no Idol dummy and is A-OK in my book ... so far! Yes, as Kara can tell you, I'm a hard one to please. But after worrying Ellen would be all joke and no substance, I am happy to report that so far, my fears have proven to be unjustified. Not only did Ellen seem to take her new job very seriously (specs perched on her nose tip and all), but she delivered sound critiques that were relevant, constructive and not so surprisingly, humorous. 3) There are Hidden Gems In That There Kodak Theatre. Yes, it is always nice come Hollywood Week to see fresh talent who we haven't already seen during the audition rounds emerge. The talent who came out of hiding tonight included peacock earring-wearing Lilly Scott, who rocked out some Ella Fitzgerald (!) on what appeared to be a very broken in guitar (digging that!). She made it through with Sam Larsen (who we still haven't seen perform), but is a guy on my radar due to the dreads. (I know, I know.) And speaking of dreads, the other hidden gem tonight for me was Crystal Bowersox. Now there's a name. With a face looking too young to be a mom of an adorable little boy, this girl who Simon described as "infectious" and "real" belted out some "Natural Woman" with a power that couldn't be denied. So what did you think of our first night of Hollywood Week? Did you like Ellen as much as me? And were you as heartbroken as me to see Vanessa Wolfe being cut after a poor performance of Blind Melon's "No Rain"? I think my bottom lip was to the floor by the time she determined she had "disappointed her momma." But I quickly recovered once I realized how spot-on Ellen really was, telling Vanessa "you're hiding inside and scared to death and you gotta let go of that because those nerves are going to kill you." And while I'm on the subject of Ellen's genius (okay, maybe I'm just overexcited here), but I loved when she said, "I think she'll get annoying" as they looked through the contestant bios. Because I think she was talking about Haley Vaughn at this point. Although Vaughn was good at times, I found her to be a bit pitchy and loud. Oh lord, I must stop. Gotta scurry off to bed. But woo-hoo, Idol is now really underway it seems! In fact, I think I'm going to pay homage to our new fourth judge and dance my way off to bed. Will you be doing the same jig? Great recap! Just discovered your blog tonight, and am happy for it. :-) I can't remember getting as excited about anyone on AI as I am about Andrew Garcia. Thanks, Tracy. Glad to have you here. Now I don't know about you, but I became super excited over AI b/c of Adam Lambert. I figure this season has some big shoes to fill, so was very pleased when Mr. Garcia came along. My gut keeps telling me he's going all the way ... and some of those ladies rocked it out last night too!! My top two so far are Andrew and Chrystal! I agree E. that Ellen added to the show with her quick quips and obviously serious voting. Her remarks were a nice equal balance of humor and constructive criticism or praise. All of the judges limited their predictable behavior last night to "let's get this done" and it was SO much less annoying. Will Kara try her "girlpower" trip on Ellen? I think not. Much more entertaining show last night. At 9pm I was like "it's OVER?" I think that says something right there, huh? I noticed right away the different cups in front of the judges. Ellen did a marvelous job. Loved her little quip to Simon at the beginning. Yes, there are some gems in the Kodak Theater. Me thinks this might be the year for the ladies! yeah, connie. no "gimmick-y" girl power here needed. hopefully, ellen has managed to put her fellow judges in their place. wait, you mean it's not about US? randy, kara, and yes (even simon) were probably thinking as soon as ellen sat amongst them, taking her job seriously and seeming to know the importance of it. and how did i know you would like chrystal :) she was def a standout. (as were all the ladies sandyeggo). just as i was starting to think i might have to blog about the x factor once idol is over, ellen and some truly gifted contestants gave us a much needed comfort boost as I think we are all geared up and now really excited for what hints to be an awesome season 9!!!! totally agree bitty! i thought ellen was great. she clearly knows what people like, so I think there will be many "that's exactly what I was thinking!" moments with her this season. made me excited for what's to come just when I was starting to get a little bored with the show! i know, i feel bad for underestimating her "smarts." i even went home and watched last night's episode on my lunch break, it got me that pumped. I have seen Sam Larsen perform. He also writes his own music. He is a very talented performer and I hope he makes it through. He has a built in fan club with the residents of Murrieta, California.